병소의 위치와 절제 범위를 고려하여 협착 발생을 최소화하기 위하여 다음과 같은 경구 스테로이드 복용을 추천합니다. 시술 2일 후 prednisolone 투약을 시작해 주십시요. 첫 1주: 매일 Pd 30mg (5mg 6알) --> 다음 주: 매일 Pd 20mg (5mg 4알) --> 다음 주: 매일 Pd 10mg (5mg 2알) --> 다음 주: 매일 Pd 5mg (5mg 1알) --> 중단. 즉 시술 다음다음 날 시작하여 1주 간격으로 용량을 줄여나가는 스케쥴입니다 (매주 약을 줄여가며 총 4주 복용 후 중단). 위 ESD 후 협착은 드물게 발생할 수 있습니다. 증상이 없는 subclinical stricture도 종종 발견됩니다. 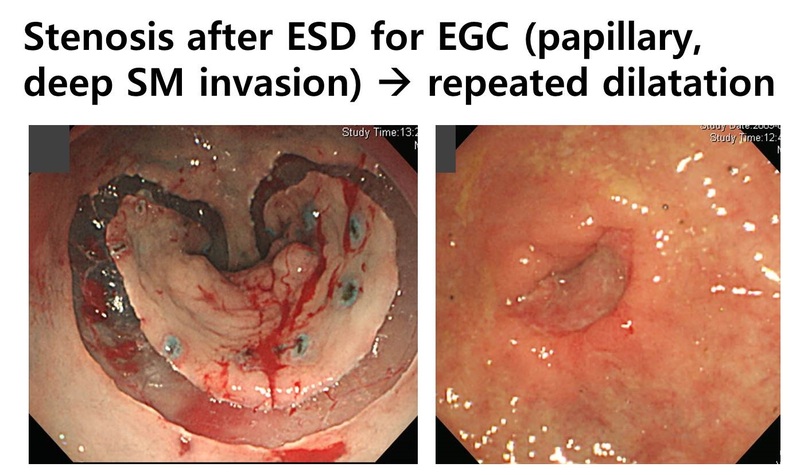 Mild to moderate stricture was developed after ESD for EGC abutting the pyloric ring, but the patient had no symptoms. Balloon dilatation is not required. Asymptomatic stricture after ESD (x). 상세 설명은 EndoTODAY 위암 599를 보세요. When the patient have symptoms of obstruction, single or multiple endoscopic balloon dilatations are required. Two small EGCs are found in the pyloric ring. Two ESDs were successfully performed in a single session. Because of the obstruction symptoms, TTS dilatation was done. After the dilatation, there was no more obstructive symptoms. There was no recurrence until now (7 years after the procedure). 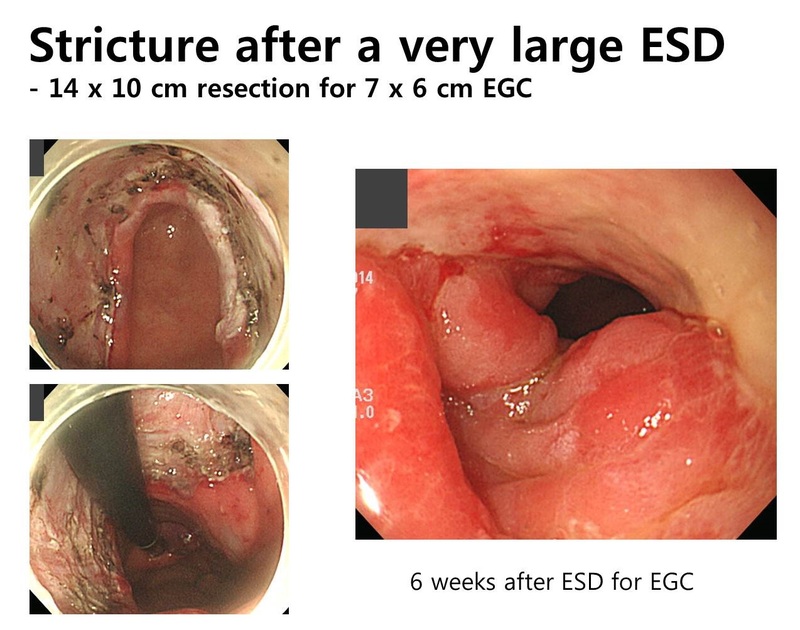 After esophageal ESD, stricture is quite common. 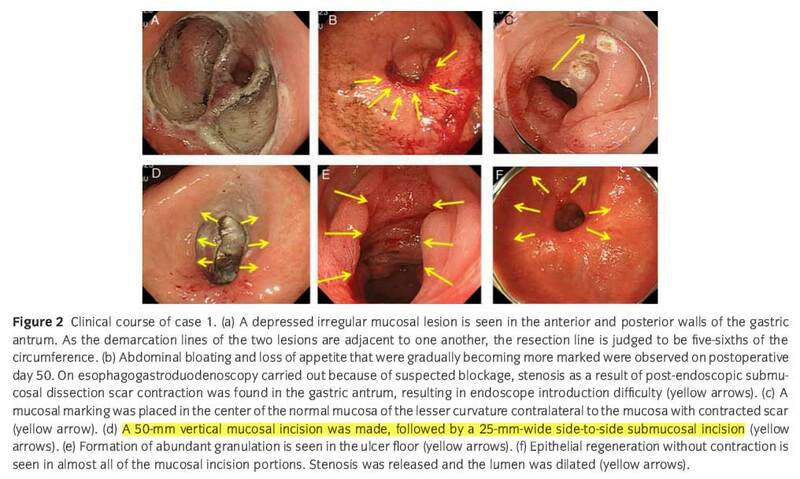 When symptoms are mild and intermittent, endoscopic treatment is not recommended. When obstuction symptom is moderate to sever, TTS balloon dilatation is usually required. In cases with circumferential ESD, preemptive treatments, as scheduled endoscotpic dilatation, triamcinolone injection, and oral prednisolone, have been tried. Currently, some authors recommended prophylatic therapy (link). Please refer to the recent review (Isomoto, 2013) for further information. 식도 circumferential ESD 후 협착 우려때문에 oral steroid를 사용하다가 nocardiasis가 발생한 증례보고가 있었습니다 (Dig Endosc. 2015). 5. 위 ESD로 인한 stricture를 막기 위하여 oral steroid treatment는 도움이 되는가? 식도 ESD 후 stricture를 막는데는 oral steroid therapy가 분명 도움이 됩니다. 이 때의 표준 protocol은 ESD 2-3일째 daily 30mg으로 시작한 후 매주 30, 30, 25, 25, 20, 15, 10, 5로 천천히 감량입니다. 아직 위 ESD 후 stricture를 막는데 식도의 protocol이 도움되는지 명확하지 않습니다. 고도선종으로 의뢰된 분으로 날문에 거의 닿아 있었고 적지 않았습니다. ESD를 하였고 최종 병리결과는 고도선종이었고 암으로 된 부위는 없었습니다. ESD로 인한 인공궤양이 distal antrum circumference의 75% 이상의 차지하고 있었습니다. PPI를 사용하면서 식도에서 사용하는 것과 같은 protocol로 steroid를 사용하였습니다. 추적관찰에서 stricture는 통상의 경우보다 심하지 않았고 증상도 없었습니다. 8주 후 사진에서 궤양이 조금 남아있었는데 over-healing을 우려하여 PPI나 H2RA를 추가하지 않았습니다. 몇 개월 후 추적관찰에서 병소는 모두 healing 되어 있었습니다. Steroid가 도움되었던 증례로 생각합니다. 향후 이에 대한 연구가 필요합니다. 최근에는 steroid 사용량과 기간을 아래와 같이 단축하여 적용하고 있습니다.